BCAA’s or (Branch Chain Amino Acids to give them their full title) are 3 essential amino acids. Leucine, Isoleucine, and Valine. The term ‘essential’ means that the body can’t produce these amino acids on its own. Therefore, they have to come from your diet. Even though these three Amino Acids are essential and need to come from your diet, it’s not quite time to be loading them into your virtual shopping basket just yet. Because, you can (and most likely are) getting BCAA’s through the regular food in your diet. And this is particularly the case if you’re consuming a high protein diet. Because BCAA’s are prevalent in meat, fish, and eggs. In fact, the protein you consume will have anywhere between 5-10% Leucine content alone. Each of the three ingredients in BCAA products have different purposes and also varying degrees of effectiveness. Now’s probably a good time to break them down one by one and look at what they do for you. Warning. This next sentence is going to sound a little like a chemistry lesson, but bear with me, we’ll be back into the fun stuff in no time. Leucine activates the enzyme responsible for cell growth known as mTOR or ‘mammalian target of rapamycin’ (told you we were getting technical). Basically, what that means is that Leucine is good for building muscle and making you buff. Sounds good, right? Isoleucine also aids protein synthesis. But to a much lesser extend than Leucine (although slightly more so than Valine). It does however increase glucose uptake in the muscles and the subsequent breakdown into energy. So more glucose equals more energy, which has got to be good for your workouts. Isoleucine also has properties that prevent the breakdown of muscle, but to a much lesser degree than something like HMB. All things considered, the main benefit of Isoleucine is that it will make better use of the carbohydrates you put in your body if taken before training. In short, pretty much nothing. No. Really. I’m not kidding. It has no unique benefits and does nothing for you that Leucine or Isoleucine can’t do already and to much greater effect. I’ll caveat that by saying that research into Valine is limited. The bottom line here is that Leucine has proven to be the most effective of the 3 amino acids in BCAA products and far outstrips the others in terms of benefits. So, we’ve established that Leucine supports packing on muscle. Isoleucine can give you energy for your workouts. And Valine is just along for the ride, not doing much at all. It might seem like based on this information, that BCAA’s ARE that must have supplement many companies would have you believe. But it’s still not time to add them to your shopping cart. It’s still not quite time to join the guys on the gym floor with their luminous nuclear waste-like drinks. We now need to look at the research that supports these claims in a bit more detail, because all may not be as it seems. I started off researching this article by trawling through a number of different supplements companies’ websites. Here’s what some of them say about their BCAA products. One such site I zeroed in on cited a scientific study that supposedly backed up their clams on BCAAs, which is at least more than the other sites had done. This study is cited as the evidence to back up those bold claims. And here is where you will start to notice some errors in the logic behind this so-called wonder supplement. The study was completed over a 10 week period, analysing the effects of Leucine on a number of different sets of athletes from runners to power-trained athletes carrying out speed and strength based training. Overall, the study ‘showed’ that consumption of BCAA before or during exercise may prevent muscle degradation and a reduction in Leucine levels. The crucial point is that the participants were on a diet consisting of 1.26g of protein per kg of body weight. I weigh 82.8kg as of this morning (that’s about 182.5 lbs for my brothers and sisters across the pond). 1.26g/kg would mean that my protein intake would sit around 104g, which I can tell you is pretty low for us lifters. I eat around 80g more than this per day. And I, like many other have had great success with this type of diet. Additionally, that high protein diet also means the Leucine content of my diet is quite high already. The conclusion of the study recommended that the strength athletes should up their protein intake to 1.5-2.0g/kg. Interestingly, it didn’t say to supplement with BCAA / Leucine as an effective way of getting results. This is because there’s little evidence to suggest that getting your BCAA requirements from normal food is any less effective than taking a specific amino product. If fact in this article by Mike Matthews at muscleforlife.com there are even studies to show that whey protein is the better source of your BCAAs. Putting another nail in the coffin is this study by researchers at McMaster University in Canada, published in the American Journal of Clinical Nutrition back in 2013. The study tested a number of different combinations of protein and amino acids, with the aim of measuring the impact on protein synthsis during periods of both rest and exercise. The research was carried out with 40 men aged around 21 years old. The results showed that group four who supplemented a low amount of protein with a high amount of leucine was more anabolic than the same dose of whey with less leucine (3 g). The low protein, high leucine drinks were no more effective than the high protein drinks. The study went on to conclude that across all the groups protein synthesis increased above the baseline between 0-1.5 hours post exercise and 1.5 – 4 hours post exercise, but was greatest in the 25g whey protein group. Why is this important? Well, I’m sure that if you’re reading this you already own a large tub of whey protein powder and a few shakers to go with it. The research is telling you that the whey protein you already own is the most effective way of getting your BCAA requirements. You don’t need to fork out the extra money to get the aminos you need. Where might BCAAs be effective? BCAA’s are at their most effective when training in a fasted state. Training on an empty stomach means you’re depleted of energy and there is an elevated risk that muscle breakdown can occur. Having a protein shake at this point is not a good strategy as it will mean you won’t actually be training fasted. Food, ie a protein shake will cause a spike in your insulin levels and pull you right out of that fasted state. This is where BCAA’s can help. We know from earlier in the article that it’s leucine that’s the star of the show when it comes to preventing muscle breakdown. Supplementing with BCAA’s so that you get c. 5g of leucine will help prevent that muscle breakdown. And in turn, it’ll make sure you keep hold of those all important gains. BCAA’s by their very nature will also cause a spike in your insulin levels (although to a lesser degree than food), which will reduce the effectiveness of your fasted training. And there’s another catch! If leucine is the only ingredient you want, aren’t you going to be a bit annoyed about paying for 3 ingredients, two of which won’t do anything for you? And to top it all off the amounts of leucine in a serving of BCAA is usually pretty low, meaning you’ll have to take multiple servings to get the amount of leucine you actually want. To me, that’s not the most effective use of your money. And if you don’t believe me, let’s look at some products out on the market today to hammer home the point. What would it cost to get the amount of leucine I need from a BCAA product? That’s right. 11p per serving. That’s just 9% of the cost of the most expensive BCAA and still only 20% of the cost of the least expensive. If your aiming to get more leucine in your diet, then it’s clear where I’d be putting my money. But there’s an even better product for fasted training! Research has clearly shown that 2-3g of HMB (β-Hydroxy β-Methylbutyrate if you want the full name and are impressed by me getting all scientific on you) has great anti-catabolic properties and has no effect on your insulin levels, making it perfect when training in a fasted state. 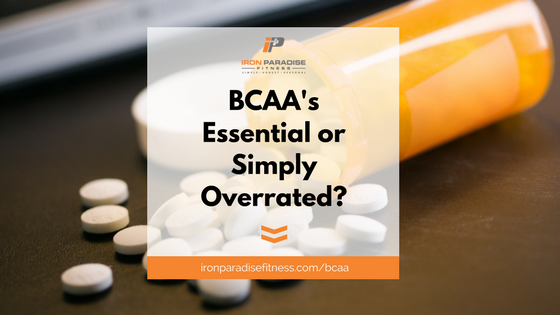 What’s the bottom line on BCAA’s? The quick summary is you don’t really need to take these supplements to get the results you want. They’re expensive and nowhere near as effective as the claims make out. Leucine is the most effective of the 3 ingredients, so pretty much discount the other two from your mind right now. Maintain a high protein diet. Make sure you’re on a high protein diet that is rich in foods containing a lot of leucine. Here’s a list ten foods with a high leucine content (check the full article out here). If you’ve got a half-decent meal plan in place then I can bet the majority of those foods are already in your diet anyway. This is a sure-fire way to make sure all your BCAA needs are catered for. But what about muscle breakdown? Simple. Make sure you consume 25-30g of whey protein and some carbohydrates both pre and post workout. That will negate the risk of muscle breakdown during and after your workout. Take 2-3g of HMB 30-45 minutes before training. It has the same anti-catabolic effect as leucine without the spike in insulin. I have two different strategies when it comes to BCAA’s. Firstly, when I’m on a cut, I only use HMB. I like to train first thing in the morning. And as I’m 100% fasted for all of my workouts I take c.2.5g of HMB pre workout. If I’m bulking then I’m less worried (in fact not at all worried) about the insulin spike I’d get from leucine. I still train first thing in the morning as that’s just my personal preference. I’m a sucker for a quiet gym. So before I workout I take a protein shake with 5g of leucine. That’s as more of a safety measure as my body won’t have had time to digest the whey protein fully before I hit the gym, whereas the leucine is more easily and quickly absorbed. I no longer bother with a specific BCAA product in any form. Simple! So I hope you found this article useful and I hope it’s saves you a few pennies in the long run. Trust me, ditch those BCAA’s and the only difference you’ll see is in your bank balance. Need help understanding more about correct supplementation? Now, if all that talk of BCAA’s left you confused about what to do next, fear not. My goal is to help you. I want to help you get in the best shape of your life in the simplest and easiest way possible. Because you don’t have to be miserable to get results. Contrary to what other coaches may say, getting lean isn’t about boiled chicken and steamed veg 3 times a day. In fact, there are so many ways of incorporating the foods you love into your diet and still get the physique you crave. And I want to show you how. I want you to have the perfect nutrition and training plan. One that gets you to your goals and is full of foods you love. And if that sounds good then my FREE ‘7 Steps to Get Lean‘ online nutrition workshop is what you need to get on the right track. And you can register for FREE by clicking the image below. In the workshop I’ll walk you through the exact approach I use with all my clients to achieve great results. And it’s also the approach I use to build my own physique. So by the end of the workshop you’ll have everything you need to achieve some fantastic results. And all without selling your soul to bland and boring food for every meal. So if that sounds good, just click on the image below and register for free. And if you do attend the workshop, you’ll be entitled to an exclusive discount on my online coaching programme.